Florida seniors are quite an influential and trendsetting group of people. If you're considering Florida as one of your places to retire, we have some interesting facts and figures for you. Mature residents are the backbone of Florida's economy, spending more than $135 billion in 2000, almost $15 billion more than residents aged 49 and under. Florida seniors over age 55 have a higher per capita income than younger residents - an average of 25 percent higher. The retirement industry, which includes housing, medical services, hospitality, and recreation, is considered to be a "cleaner" industry than manufacturing and thus, is better for the environment. 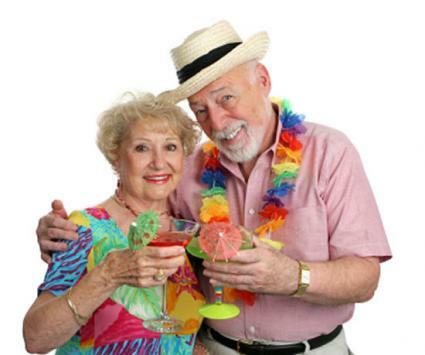 Many retirement communities are designed with direct input from Florida seniors. The impact is so great, other locales are duplicating the results. The policies for senior job placement and employee retention are constantly examined, based on active participation of Florida seniors. Florida's pilot initiative "Profit Through Experience" is a program to broaden the skills of retirees. Another statewide initiative, Communities for a Lifetime, challenges municipalities to design communities to ensure a better quality of life. Almost every community has some type of senior gathering place, such as a senior center or wellness center, but Florida seniors like to socialize with one another in other ways, too. Here are just a few examples. The mayor of Jacksonville, FL, encourages Florida seniors to get out and about with the Mayor's Special Events for Senior Citizens. Activities throughout the year include special dances, complimentary baseball games, legislative forums, bowling tournaments, and more. Lifelong learners will enjoy Senior Summer School, a Florida-based program that combines senior travel with education. Groups can travel throughout Florida and other locations. The Florida Senior Games rallies together athletes over age 55. There are a number of decisions to make before relocating to any new destination. Grant yourself the time to do the necessary research and make all the preparations for an easy transition to Florida senior living. The Florida Department of Elder Affairs. Get facts on senior housing, medical facilities, cost of living statistics, senior services, and more. Not sure you want to take the full Florida plunge? Learn about life as a snowbird.